Zach Stone was one of the first undergraduate students to join the Materials Science and Engineering program back in 2001. Starting with a class of only five students, his skills in metallurgy landed him work with Sikorsky and UTC Aerospace Systems. Now, he works at Vuzix Corporation, one of the leading companies in breakthrough augmented reality technology, paving the way for new innovations in the video game, medical, business, and educational fields. 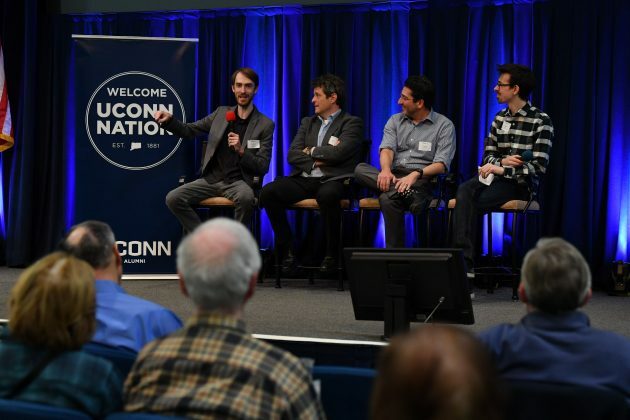 Recently, he appeared at the UConn Science Salon series to discuss the future of AR and VR with students and faculty. What started you off on materials science? I originally started in computer science, which I quickly realized I was woefully unprepared for. At the time, UConn was trying to get their materials science program up and running, and I decided to give it a try after seeing some of the demos they had on display during an informational meeting. In my graduating class, there were five people, which meant there was a great student-professor ratio. We were all really close, and I still keep in contact with everyone I graduated with. What appealed to you about the program? We had a truly unique experience. Like I said, we had a low student-to-teacher ratio. The professors were developing the courses as we went along. I felt like everyone wanted this undergraduate program to succeed, and we rose to the occasion. The classes were tough, but we learned so much from them. One of my favorite courses was our casting course. We were casting aluminum in one of the physics buildings, and the casting facility had all these CRT monitors around it. When we worked on the aluminum foundry, the magnetic field would distort all the monitors and they’d have to turn them off. So every time we melted aluminum, everyone in the building would get mad at us. What were some unique experiences you had in the program? In my senior year, I undoubtably learned to step outside my “safe zone,” so to speak. My senior design project was studying recycled aluminum and removing impurities from it, like iron and steel contamination. This is genuinely important for airplane and automobile recycling and reprocessing. We took bars of aluminum and tried different methods to remove impurities. It was me and one other student, and we were sponsored by Bodycote, a metallurgy company. Our research did end up having an impact, and I believe Bodycote even sponsored follow up projects with UConn to verify our findings. Where did you go after UConn? I was at Sikorsky for five years as a member of the failure analysis team. Later on, I was with UTC in their Operations Leadership Program for two years, and then as a materials manager in Orange County, California. In 2008, I went to the University of New Haven for my MBA/MSIE. 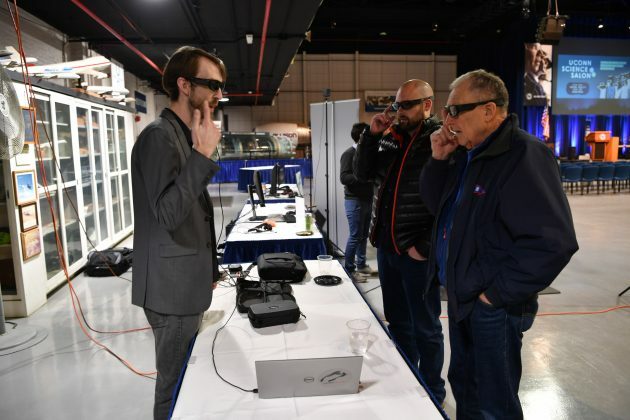 After working in the world of engineering for a while, I got the opportunity to work with a startup company in Rochester, Vuzix. That was three years ago. I started as a quality manager for products, but I’m now vice president of operations there. Our products are augmented reality (AR) glasses. We implement video and camera technology into wearable items, allowing people to see through a camera or into a video input. One of our products, Blade, is a pair of sunglasses that pulls up your phone apps, call and information right in front of your eyes, so you aren’t looking down at your phone all the time. How do you bring materials science into it? One of my current jobs is overseeing the supply chain and manufacturing of the products we sell. Part of the reason I’m able to do what I do is because I have a strong engineering background. It’s a whole mindset behind how you can use the materials at hand to make what you need. So, I can look at costs, strengths and weaknesses, implementation, and the overall effect a material can have on the product. I use these advanced material concepts to my advantage—and, of course, it helps to have a broad base. It’s been a lot easier that way, for me to expand into different roles. What influenced you the most during your time in the MSE department? Definitely my advisor, Dr. Brody. He taught me how to be flexible and how to roll with the punches, which has been critical throughout my time in the department and after I graduated. My time as a student was a nonstop group of challenges that I had to adapt to, and that level of demand shaped me and how I handled it. Really, though, every professor I had was engaged in our success. We got a lot more facetime than most students, which I hear is still the case now for current MSE students. I look back at my time there fondly. It really was a good program.